Now is a good time to inspect your home for wasp nests that are being constructed. It is easy to overlook nests when they are small and there are only a few wasps present. However, that is the best time to treat them when you can find them. Some wasp nests are built out in the open, e.g. under an eaves, and are the easiest to find and control. the queen was later released to nest else where. If a small, exposed nest is discovered, there are a couple of options for controlling it. Regardless of which method you use, deal with nests at night when the wasps are not very active. The easiest method is to spray a wasp and hornet insecticide into the nest to kill all of its inhabitants. If you want to control it nonchemically, remove the nest by placing a clear glass or plastic container over it and moving the jar so the nest is knocked down into the container. Slide a piece of cardboard (or something similar) so you can bring the jar down without the wasps getting out. Then slide the lid on the jar. Either release them so they can build a nest somewhere else or place them in a freezer to kill them. 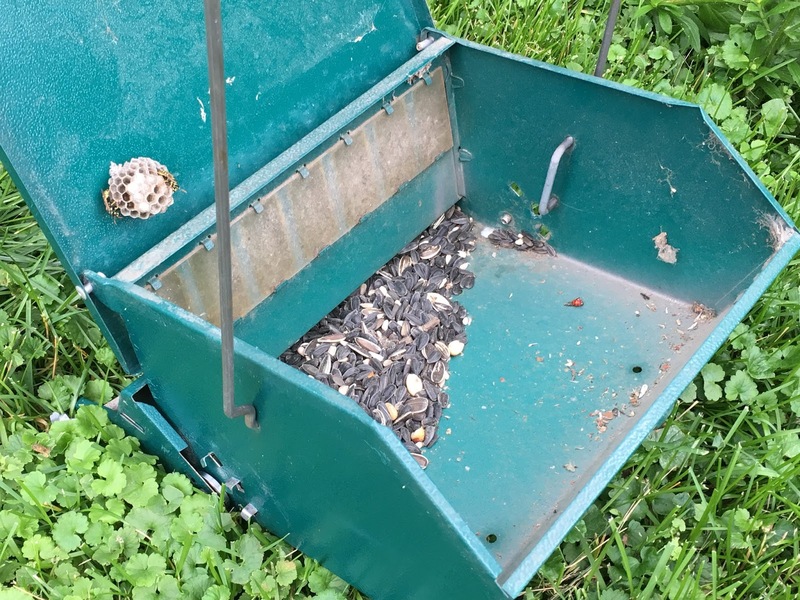 Nests that are hidden, such that you can see wasps flying in and out of a space, but the nest in not seen, are more challenging to find because there are not as many wasps flying back and forth to give away the location of their home. These nests are typically not discovered until late summer when larger numbers of wasps are present. Control of these nests is more challenging because spraying into the opening rarely gets into the nest to kill the wasps. An insecticidal dust is the best option. However dusts labelled for buildings are not commonly available to residents and are often difficult to find. The best option then is to contact a pest management service to treat the nest. The nests of European paper wasps are particularly interesting because they will nest in such a wide variety of sites. They can be found exposed on horizontal and vertical surfaces as well as in all kinds of cavities. They can be found in the most unexpected places, like in bird feeders. Deal with them as you would other wasps. For more information about wasps, see Social Wasps and Bees in the Upper Midwest. I have a story about a paper wasp nest that will make you cringe. In the summer of 2016 my mother decided to leave one of our sliding windows opened and that left our house wide opened to let paper wasps inside the window to build their nest there. All my mom did was slam her hand down on the window sill and lots of them flew out of the nest to attack. There were already some dead paper wasps inside the window so my mother had to get some wasp killer to get rid of them. Not that we like to kill any living creature but if we didn't get rid of the nest there would be some problems. Sheesh this nest was huge and had we let the paper wasps finish their nest it would have filled out the entire window.